As discussed in the morning update, the cold front continues across the UK and is currently roughly N-S oriented across the western England. Latest radar scans reveal several convective linear segments are embedded along the front, bringing heavy rain and strong to locally severe winds. 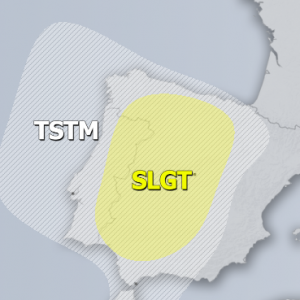 Area is included in the SLGT risk area of DAY 1 Outlook for 26/10/2013. Convective lines will continue progressing east into western continental Europe when diminishing overnight. The whole frontal system / intense cyclone looks rather impressive on satellite image, located NW of UK and slowly progressing east. The central pressure at 12 UTC analysis update was 958 hPa. The UK visible satellite imagery is showing the frontal boundary crossing the UK with a very cold maritime airmass behind it, approaching the Ireland where widespread showers and some weakly electrified storms are occuring. Some isolated storms are also occuring over central France within the SLGT risk area of DAY 1 Outlook for 26/10/2013 where storms are capable of producing some heavy rain and strong winds. Follow this powerful storm system crossing western Europe today on Ireland radar, UK radar, France radar, Belgium radar, Netherlands radar and satellite pages.